Three men have been rescued after their fishing boat broke down off the coast of the Isle of Man. Port St Mary's all-weather lifeboat Gough Ritchie 2 was launched at 17:55 GMT on Wednesday after being alerted by Belfast coastguard. The RNLI said the scallop fishermen were "fit and well" when found on board the locally owned 14m (46ft) boat. 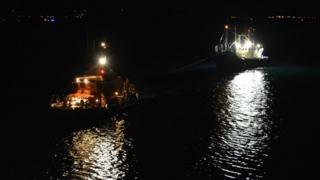 He said their trawler had suffered steering problems 10 miles (16km) south-east of Port St Mary.